Google Maps for Android has many strengths, but using its virtues for offline navigation isn't one of them, especially in a few versions before the latest 8.0 redesign. 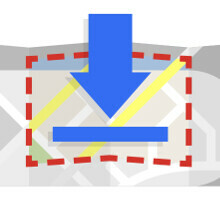 You still can't navigate with turn-by-turn directions offline in Google Maps 8, but the ability to save areas of the map for later usage is more easily accessible now, and a larger part can be downloaded with a much lower storage footprint. That's not the only improvement in the new Google Maps 8.0, as the interface has received a welcome redesign, too, and navigation options are now made richer, and easier to master. The bottom bar now showing distance, travel time and ETA, and you can also redirect on the fly. Not only that, but the new Maps software gives you lane guidance, though not in all markets. The public transport option has been enhanced, too, and for the first time a transport service like Uber has been given representation. Check out the new way to save areas in the Google Maps 8.0 offline mode, and remember this is still not a replacement for a true offline turn-by-turn navigation app, the best of which are paid. Damn, my area is not available !!! "Area too large" - pathetic! And that is when area is actually available. Which is even more pathetic - it is shown but for some obscure reasons is not available. Actually, the option to save maps for offline use was an option in the menu, IIRC, before it became a sort of Easter Egg. I'm glad that it's back as an explicit option.